Food and where to eat? Few technical details. On all days there will be catering and you can count on sandwiches, tea and coffee. There is also 2-hour-long break so you can go out and buy something. Go and see the list of restaurants recommended by the locals. We’ll be chilling in Mleczarnia after Saturday talks. The party starts at 21:00. Make sure to take your conference badges with you. Located on ul. Włodkowica 5, but I recommend you to choose the entrance in backyard accessible from ul. Św. Antoniego. There’s a passage depicted below you should take to get there. 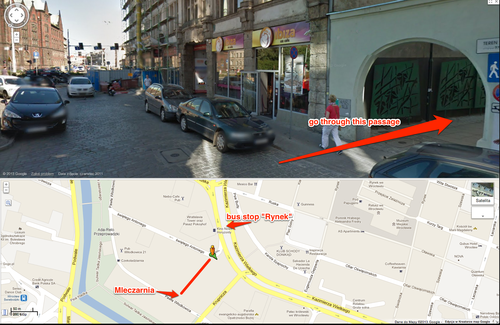 It is also the shortest path from tram stop “Rynek” (tram lines 3, 6, 7, 10, 14, 15, 20). 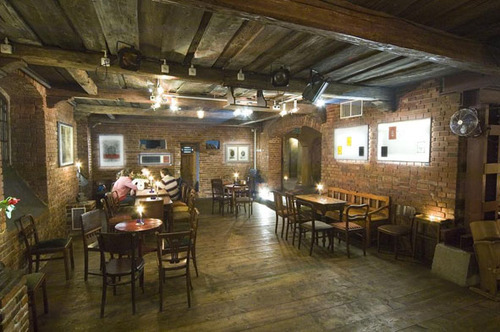 If you’re located in the city centre that’s a 5 min walk from Market Square. For the record: street views from the beginning of the passage, tram stop and front entrance.